Getting an MBA? Should you bother? Harvard Business School was the priciest school — costing $126,000 over two years — but its graduates command the highest pay three years after finishing at about $190,000 per year. Stanford University’s Graduate School of Business was number two. The London Business School was tops in Europe and fourth overall while the Hong Kong University of Science and Technology came in first among Asian schools. 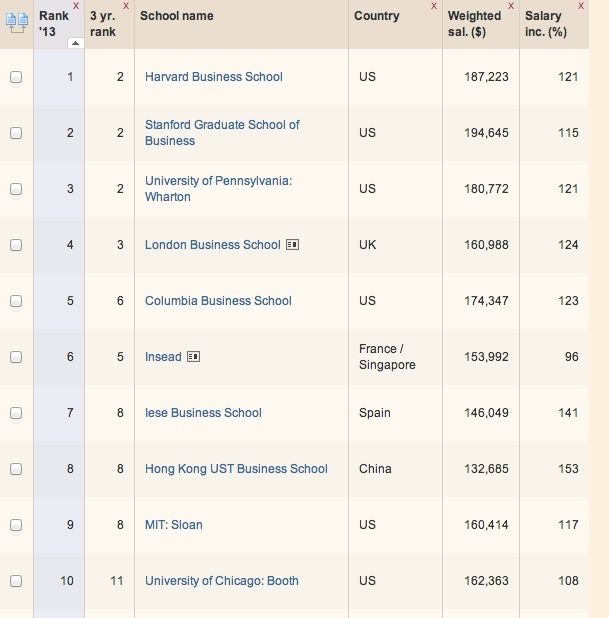 The top ten schools are below but check out the full FT Global MBA survey. Many of the schools you listed carry a heavy weight through out the majority of industries. This will always be an advantage to graduates from those schools. However, those considering an MBA certainly don’t need to spend upwards of $160k to move forward in their careers. People that are highly motivated and moving up will only be helped by getting an MBA, as it will provide additional opportunities. But which MBA program is an important consideration and very dependent on the candidate. I’m currently working on a book that looks at this topic in depth: http://www.bitesizebschool.com/thebook/. I looked heavily into MBA vs. MS in Tech a couple of years ago. I’m a little more advanced in my career than most MBA students. I decided on a IT Project Management degree that had the components of the MBA I wanted and allowed me to fill some gaps in my tech skill. It’s been roughly 7 months since I finished the program and I’m very happy with the decision. It seems employers have been more impressed with the fact that I considered the business components of the degree over the tech merits. From a practical since, I’ve been able to apply knowledge from both aspects of the curriculum. It’s too early in the process to quantify the payoff but early indication is that it was well worth the investment. It’s not what degrees you possess but how well you can actually leverage the skills taught in the curriculum. That is the true value of a person regardless of what level of education they’ve attained. The only thing an MBA on a resume shows me is that the person has the compentency to pass courses. If they have no experience or solid representation of the skills taughts in an MBA degree then it’s not worth much. Everyone seems to highlighting the ‘decline’ of the MBA without seeming to recognise it as one of the most hyped and over-valued degrees. This downward trend is simply a return to normality – and still has some way to go. Business awareness modules, embedded within other degrees (including traditional masters degrees which have become very much under-valued at the same time), would add significantly more value to our future employee base in my view. We need far more broadly competent people, as well as a reprisal of with a strong foundation in engineering and science. Uh, that seems to be in line with the downturn in the economy rather than something to indicate that getting an MBA isn’t worth as much. It reinforces the Outliers point of when you were born makes the most difference in your generation’s income level more than anything else. Startups may not value an MBA, but from my experience with dealing with a lot of startups, they certainly could use some marketing and business sense, whether or not they have an MBA or not. If you look around the emerging successful companies, they were driven by design and tech thinking rather than the traditional MBA style thinking. In the future market, that is dead on arrival thinking. MBA can be used to align a business but gone are those days where it had used to innovate or disrupt markets. Another important factor is the age of the graduates. My understanding is that the average age & work experience of newly minted MBAs is much lower than what it was in the past. This probably also has created some downward pressure on salaries.